Just posted this today at the HBU School of Christian Thought blog. Reblogging for those who don’t catch the SCT site regularly. One of our MA in Biblical Languages students did an undergrad degree in French at the University of Oklahoma. 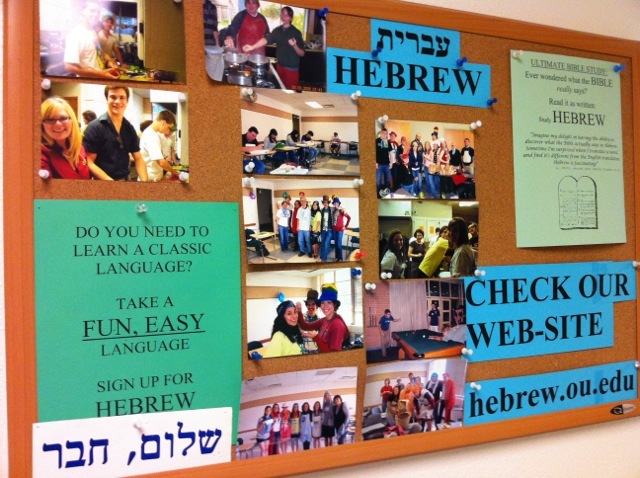 While on a brief visit to his old alma mater recently, he snapped this picture of one of the bulletin boards in the language department. Especially intriguing is the green flyer. So . . . Hebrew is a fun, EASY language! Who knew? One of our MABL (Master of Arts in Biblical Languages) students is showing a set of skills I had heretofore not seen in full blossom–he’s very nearly a stand-up comedian! Today he passed along some language jokes that would make any elementary Greek and Hebrew professor very proud, and thankfully, he has permitted me to post them here. Enjoy! And if you don’t smile, then please take it as definitive proof that you *need* to come study Greek and Hebrew here at HBU! Merry Christmas! (1) Q: What kind of poker do Hebrew cowboys play? (2) Q: Where did extremely sick adjective go? (3) Q: What Hebrew vowel is so rare it only occurs in texts once every 75 years? (4) Q: What kind of airplane do Greek pronouns fly in? A: The Pronominal Concorde, of course. (5) Q: Which Hebrew vowel has also starred in several extremely violent action movies? (6) Q: What’s the best app for studying Greek grammar? (7) Q: Why do so many young Hebrew farmers move to the city after their first crop? A: How can you keep them on the farm once they’ve seen פְּרִי? (8) Q: How do you know you’ve been studying Greek too hard? A: At Christmas you see “‘Tis the season” and start trying to parse the “τις”. (9) Q: How are many aspiring comedy careers like tsere, qamets, and chireq? A: They’re not historically long. 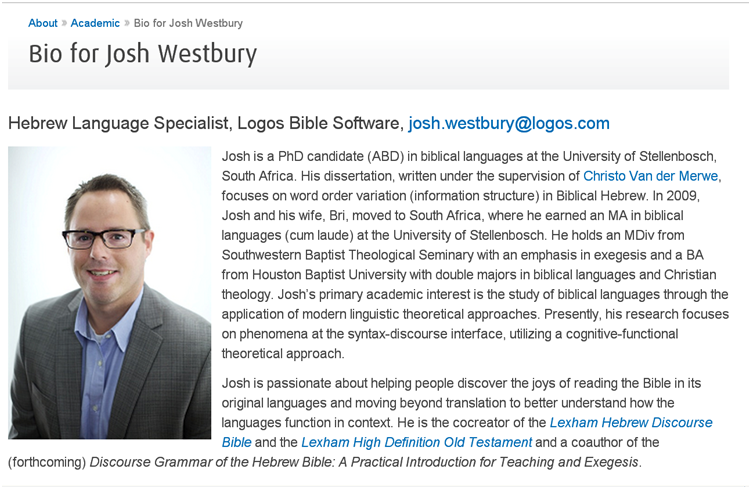 This is an invitation to those in the Houston area who love Biblical Hebrew and the Hebrew Bible: On Friday, Sept 21, at 11am at Houston Baptist University, Dr. Marshall will have as a guest lecturer in the Hebrew Reading course Josh Westbury, Hebrew Language Specialist from Logos Bible Software. He will be talking about some of the discourse features of Biblical Hebrew from Genesis 37 and 39, as well as giving us a peek at the new Lexham Discourse Hebrew Bible database and how it can is useful for just this sort of analysis of the text. Why? Because we love Biblical Hebrew, we love linguistics, and we love talking about both of them together! Oh, and we love you, too, which is why you’re invited to come. Please let me know if you are coming (and you’re not one of my Hebrew students)–you can just reply to the post here if you’d like. Robert Holmstedt of the University of Toronto recently posted a piece over at Ancient Hebrew Grammar on the function of book reviews, in light of a few negative reviews of his book Ruth: A Handbook on the Hebrew Text. He makes some great comments on what a review should aim for, especially how reviews ought to assess the success of any work based on the author’s purpose (and the series’ purpose, if it is a volume in a series). I recommend that all my students take a look at what Holmstedt has to say on this.